U.S. President Barack Obama has vowed to help France in “hunting down the perpetrators” of Friday's Paris attacks and said he plans to "redouble" efforts to eliminate the Islamic State group, known in Arabic as Daesh. 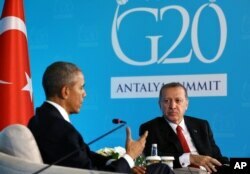 Obama spoke on Sunday after meeting with Turkish President Recep Tayyip Erdogan at start of the G-20 summit in the Turkish Mediterranean resort of Antalya. “We will redouble our efforts working with other members of the coalition to bring about a peaceful transition in Syria and to eliminate Daesh as a force that can create so much pain and suffering for people in Paris and Ankara and other parts of the globe," Obama said. Obama pledged solidarity with France and condemned the coordinated attacks Friday night in the French capital. "The killing of innocent people, based on a twisted ideology, is an attack not just on France, not just on Turkey, but it's an attack on the civilized world," he said, also referring to the twin bombings at a leftist rally in Ankara last month that killed well over 100 people. Islamic State militants claimed responsibility for the attacks both in Paris and Ankara. Friday’s attacks in Paris topped the agenda on the first day of talks among leaders of the world’s 20 biggest economies, which were meant to focus on trade, energy and climate change. 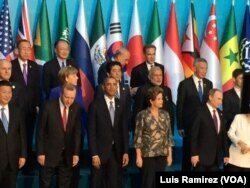 G-20 leaders held a moment of silence for the victim's of the attacks. U.S. President Barack Obama, front center, joins other Group of 20 world leaders for a group photo in Antalya, Turkey, Nov. 15, 2015. The Paris attacks were also expected to push along and consolidate efforts to resolve the conflict in Syria. Hours before the assaults happened, National Security Advisor Susan Rice on Friday said the G-20 would be a “useful opportunity” for key leaders to concert efforts on Syria. Just before departing the White House, President Obama met with his national security team and got an intelligence assessment. Analysts say Obama is compelled to step up the campaign against the Islamic State group and the two-day summit provides a chance for him to huddle with leaders of other nations who are also battling the group. A number of G-20 nations are taking part in the fight against IS and discussions on the matter were expected to take place during the two-day meeting. French President Francois Hollande canceled his plans to attend the meeting immediately after Friday’s attacks. 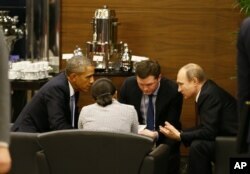 U.S. President Barack Obama, left, speaks with Russian President Vladimir Putin, right prior to the opening session of the G-20 summit in Antalya, Turkey, Nov. 15, 2015. On the sidelines of the summit, Obama had a "constructive discussion" Sunday with Russian President Vladimir Putin about Syria, according to a White House official. "The conversation lasted approximately 35 minutes and centered around ongoing efforts to resolve the conflict in Syria, an imperative made all the more urgent by the horrifying terrorist attacks in Paris," the official said. The two sides have a complicated relationship in regards to Syria, with Moscow continuing to support the government of Syrian leader Bashar al-Assad while Washington calls for Assad to leave power. Analysts say the attacks in Paris opened a new opportunity for the two sides to work in a common effort against the IS militants. A meeting of foreign ministers in Vienna ahead of the G-20 appeared to set the stage for new cooperation despite differences. Secretary of State John Kerry and Russian Foreign Minister Sergei Lavrov, at a joint news conference Saturday, said the U.N. has agreed to bring Syrian government and the opposition together at a meeting and a ceasefire is expected within six months. U.S. President Barack Obama, left, speaks to Turkish President Recep Tayyip Erdogan during a meeting in Antalya, Turkey, Nov. 15, 2015. Obama is on a nine-day trip to Turkey, the Philippines and Malaysia for global security and G-20 Summit. One of President Obama’s first meetings in Antalya was with his Turkish counterpart, a key partner in the fight against the Islamic State terrorists. For months, Turkish security have been stepping up their raids against what officials say are Islamic State cells, mainly in the southeast of Turkey near Turkey’s borders with Syria and Iraq. The Turkish government was at first reluctant to participate in U.S.-led efforts against the militants, but has since allowed the U.S. to launch attacks from bases in Turkey and has carried out bombing campaigns of its own. The G-20 summit took place amid high security, with 12,000 Turkish soldiers and police deployed around the resort as leaders and top officials of the G-20 and other nations arrived, along with 3,000 journalists. Turkish military officials said they had put in place a 24-hour air defense system over the area during the two-day meeting.